Around 2 am, I sat up. The notebook! I bought this notebook back in 2015. November 29, 2015 to be exact—that’s the date scrawled on the first page. I so clearly remember sitting at my kitchen counter and the Jack Gilbert quote on the cover. 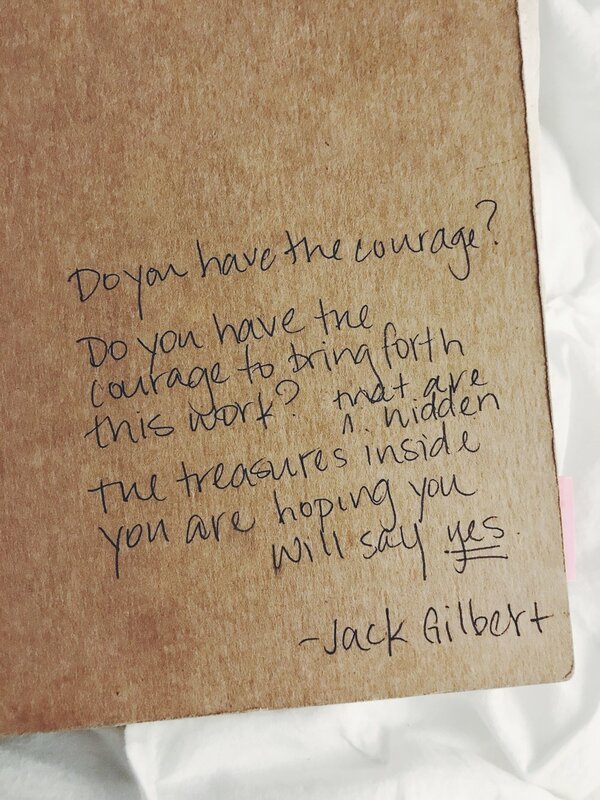 Do you have the courage? At that time, I was a couple months sober and my brain felt like it was exploding on a regular basis. I had so many ideas…things to write, to say, to do. I couldn’t move or think fast enough: I kept missing my train stop to work a half-dozen times because I’d be feverishly tapping something into my phone, trying to get it down; I’d wake up, like clockwork, between 3:30 and 4 a.m.—with some idea that needed me to pay attention to it right then. I was constantly flipping back and forth from the tactile, daily tasks of my current life: making lunches, school drop-off, commuting to Boston, answering emails, scheduling playdates—to this other life that was beating louder and louder inside my chest: write, it said; dream, it said; LISTEN TO ME, it said. And so, I kept listening. I followed clue after clue even though I wasn’t sure where it was leading me. I kept writing on my blog. I co-created HOME podcast. I started planning workshops. Every morning I said the same prayer: just speak to me in a way I can understand. The first pages are filled with ideas for my first workshop. It was titled “Working with Fear and Manifesting Change” and it took place at South Boston Yoga in April of 2016. I co-taught it with my now dear friend Becky Vollmer, who—until I picked her up from the airport for that weekend—I’d only known via phone and email. We sold it out. I had no idea what I was doing. Inside the notebook, there are questions: Where can you be of most service? What are you afraid of? What are you unwilling to leave behind? There are ideas for blog posts, song lyrics, yoga sequences, and what looks like a constant document of my fears: I’m not ready. I will fail. It’s too late. I’m not disciplined enough. Who do you think you are? On my flight to Seattle, I flipped through the whole thing. It is now the document of every workshop and retreat I’ve done since 2015: all 22 of them. It’s traveled to Austin, Denver, San Francisco, LA, NYC, Chicago, Portland and Seattle (twice). It includes my first ideas for a workshop called The Bigger Yes. At the bottom of that page I wrote, What is your sweetest longing? And then, Don’t wait.